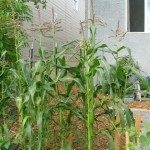 My corn is growing only 2-3 feet tall. What is wrong with my soil? They may not be getting enough water. Corn has very shallow roots and needs lots of water during its active growth, especially in temps as high as you are experiencing. Typically, the garden needs about an inch or so of water each week. It is a good idea to water deeply (for about 20 min. or so) every other day or two, depending on the weather. Once temps reach 85 F and up, daily watering is often necessary. The soil could also be lacking nutrients, like nitrogen, which is responsible for growth. A soil test could help determine what, if anything, is lacking or needs to be added.